To Sherlock Holmes she is always the woman. "He was, I take it, the most perfect reasoning and observing machine that the world had seen: but, as a lover, he would have placed himself in a false position." "It is quite a three-pipe problem, and I beg that you won't speak to me for fifty minutes." "A man should keep his little brain attic stocked with all the furniture that he is likely to use, and the rest he can put away in the lumber room of his library, where he can get it if he wants it." "I read nothing except the criminal news and the agony column. The latter is always instructive." ...I am no doubt indirectly responsible for Dr. Grimesby Roylott's death, and I cannot say that it is likely to weigh very heavily upon my conscience. ...there was but one woman to him, and that woman was the late Irene Adler, of dubious and questionable memory. "My dear Holmes," said I, "this is too much. You would certainly have been burned, had you lived a few centuries ago. It is true that I had a country walk on Thursday and came home in a dreadful mess, but as I have changed my clothes I can’t imagine how you deduce it. As to Mary Jane, she is incorrigible, and my wife has given her notice, but there, again, I fail to see how you work it out." "Quite so,"he answered, lighting a cigarette, and throwing himself down into an armchair. "You see, but you do not observe. The distinction is clear. For example, you have frequently seen the steps which lead up from the hall to this room." "How many? I don’t know." "Quite so! You have not observed. And yet you have seen. That is just my point. Now, I know that there are seventeen steps, because I have both seen and observed. By the way, since you are interested in these little problems, and since you are good enough to chronicle one or two of my trifling experiences, you may be interested in this. "He threw over a sheet of thick, pink-tinted notepaper which had been lying open upon the table. "It came by the last post,"said he. "Read it aloud." "There will call upon you to-night, at a quarter to eight o’clock," it said, "a gentleman who desires to consult you upon a matter of the very deepest moment. Your recent services to one of the royal houses of Europe have shown that you are one who may safely be trusted with matters which are of an importance which can hardly be exaggerated. This account of you we have from all quarters received. Be in your chamber then at that hour, and do not take it amiss if your visitor wear a mask." "This is indeed a mystery," I remarked. "What do you imagine that it means?" "I have no data yet. It is a capital mistake to theorise before one has data...."
"Well, Watson," said Holmes when our visitor had left us, "what do you make of it all?" "I make nothing of it," I answered frankly. "It is a most mysterious business." "As a rule," said Holmes, "the more bizarre a thing is the less mysterious it proves to be. It is your commonplace, featureless crimes which are really puzzling, just as a commonplace face is the most difficult to identify. But I must be prompt over this matter." "What are you going to do, then?" I asked. "To smoke," he answered. "It is quite a three pipe problem, and I beg that you won’t speak to me for fifty minutes. "He curled himself up in his chair, with his thin knees drawn up to his hawk-like nose, and there he sat with his eyes closed and his black clay pipe thrusting out like the bill of some strange bird. I had come to the conclusion that he had dropped asleep, and indeed was nodding myself, when he suddenly sprang out of his chair with the gesture of a man who has made up his mind and put his pipe down upon the mantelpiece. "Sarasate plays at the St. James’s Hall this afternoon," he remarked. "What do you think, Watson? Could your patients spare you for a few hours?" "I have nothing to do to-day. My practice is never very absorbing." "Then put on your hat and come. I am going through the City first, and we can have some lunch on the way. I observe that there is a good deal of German music on the programme, which is rather more to my taste than Italian or French. It is introspective, and I want to introspect. Come along!" We travelled by the Underground as far as Aldersgate; and a short walk took us to Saxe-Coburg Square, the scene of the singular story which we had listened to in the morning. It was a poky, little, shabby-genteel place, where four lines of dingy two-storied brick houses looked out into a small railed-in enclosure, where a lawn of weedy grass and a few clumps of faded laurel bushes made a hard fight against a smoke-laden and uncongenial atmosphere. Three gilt balls and a brown board with "JABEZ WILSON"in white letters, upon a corner house, announced the place where our red-headed client carried on his business. Sherlock Holmes stopped in front of it with his head on one side and looked it all over, with his eyes shining brightly between puckered lids. Then he walked slowly up the street, and then down again to the corner, still looking keenly at the houses. Finally he returned to the pawnbroker’s, and, having thumped vigorously upon the pavement with his stick two or three times, he went up to the door and knocked. It was instantly opened by a bright-looking, clean-shaven young fellow, who asked him to step in. 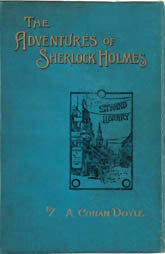 "Thank you," said Holmes, "I only wished to ask you how you would go from here to the Strand." "Third right, fourth left,"answered the assistant promptly, closing the door. "Smart fellow, that," observed Holmes as we walked away. "He is, in my judgment, the fourth smartest man in London, and for daring I am not sure that he has not a claim to be third. I have known something of him before." "Evidently," said I, "Mr. Wilson’s assistant counts for a good deal in this mystery of the Red-headed League. I am sure that you inquired your way merely in order that you might see him." "The knees of his trousers." "What I expected to see." "Why did you beat the pavement?" "My dear doctor, this is a time for observation, not for talk. We are spies in an enemy’s country. We know something of Saxe-Coburg Square. Let us now explore the parts which lie behind it."